Very Good. A follow-up to the "Kitchen Confidential." 284 p.
Good. A follow-up to the "Kitchen Confidential." 284 p.
Very Good. 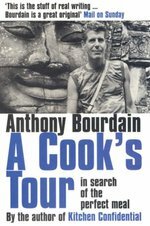 A Cook's Tour: In Search of the Perfect Meal; 384 p.
Good. A Cook's Tour: In Search of the Perfect Meal; 384 p.